The quaint and beautiful river town of Muncy once again is the setting for the Muncy Historical Society’s annual Quilt Show. Slated for July 15-16, 2016 visitors will have the opportunity to view antique and contemporary quilts at the Quilt Show in the Celebration Hall and Fellowship Room, at the show’s new location, First United Methodist Church, 602 S. Market Street. This new location features easier access and more convenient and ample parking. Admission to the two-day show is $8 for a single day or $12 for a multi-day pass. The show runs from 10 a.m. to 8 p.m. Friday, July 15 and from 9 a.m. to 3 p.m. Saturday, July 16. A highlight of the show will be the silk globe made by Anna Webb in 1816 while she was a student at Westtown School. Philadelphia Quakers raised the money to build the boarding school and Westtown School, located in Chester County, opened in May 1799. The Quakers wanted to provide their children with “guarded education” away from the secular influences of society. Westtown School has nine of the thirty-nine known to exist in the United States and England; nearby Chester County Historical Society has four globes in its collection; and the Muncy Historical Society has Anna Webb’s. The Society’s globe was donated by Nancy Doutt on behalf of her Muncy Township Fry family siblings, descendants of Anna (Webb) Ritter. Anna Webb also made her husband-to-be’s wedding shirt and that will be on display near the globe. This juried show is open to all quilters! We anticipate more than 120 stunning antique, vintage and traditional quilts will be displayed, representing virtually all styles. Now in its twelfth year, the event is a showcase of spectacular hand and machine workmanship, appliqué and quilting techniques, reflecting the originality of the makers and their expertise with needle and thread, as well. The 2016 Quilt Challenge theme is “Quilter’s Choice: Muncy Compass, Mariner’s Compass, or Trip Around the World.” This is an opportunity for quilters to enter a quilt, or quilts, based on any, or all, of the three challenge patterns. The Society will display its circa 1850’s friendship quilt from which it produced the Muncy Compass quilt pattern as well as the replicated quilt made, and donated to the Society. The show activities have been selected to appeal to all ages and young people are encouraged to attend. This event is a glorious, colorful, educational and celebrated occasion. Quilt Registration – Open to all quilters! Antique and vintage quilts, both from private collections and from the museum’s collection, are exhibited at Muncy Historical Society’s quilt show. Anyone wishing to exhibit a quilt from their private collection must complete a quilt show registration form, available by calling 570-546-5917 or online at 2016 Muncy Quilt Registration Form. Registration forms and quilt entries must be received by the Muncy Historical Society on, or before, July 7, 8 or 9, 2016 from 9 a.m. to noon, or earlier by advance appointment. Quilts should include a cloth label with the name of the quilt, the owner’s name and address sewn to the back of the entry. A 4-4 ½” hanging sleeve should be affixed to the quilt. Quilt pick-up is scheduled for Saturday, July 16 from 4-5 p.m. or Monday, July 18 between 9 a.m. and noon at the museum. Karen Powers will conduct pre-scheduled appraisals on old or new quilts or tops, blocks, or quilted wearable art. It takes approximately 35 minutes to complete each appraisal, which includes time for consultation, a written appraisal, her qualification document, an informational handout on quilt care and storage and photos of the quilt. The fee per item includes a written appraisal and is $50. Karen Powers is an appraiser of quilted textiles, certified by the American Quilter’s Society, and a member of the Professional Association of Appraisers – Quilted Textiles (PAAQT). A quilter for more than 35 years, she is also a quilt historian and practicing quilt restoration artist. Karen maintains an extensive reference library including books on quilt making, quilt history, and textile production, and also owns many publications resulting from individual state quilt documentation projects. Call 570-546-5917 or email MuncyHistorical@aol.com to schedule a quilt appraisal. Quilt Workshop; Pinwheel Plus – Saturday, July 16, 9 a.m. to 3 p.m. This year’s educational and hands-on workshop, entitled “Pinwheel Plus,” will be conducted by Sandra Swanson. “Pinwheel Plus” in one of the kaleidoscope-effect quilt patterns chosen for this workshop from Bethany S. Reynolds’ Magic Stack-N-Whack book. Swanson, from Riverside, California, has been an avid quilter since 1985.When everyone was stripping with Eleanor Burns and before rotary cutters and rulers were developed for the quilting community she started with Quilt in a Day Log Cabin quilts, making dozens. In 1992 she joined a large quilting guild in California and began to take many workshops from as many national teachers as were offered. The National Quilting’s Association annual quilt show was hosted by this guild in 1995. 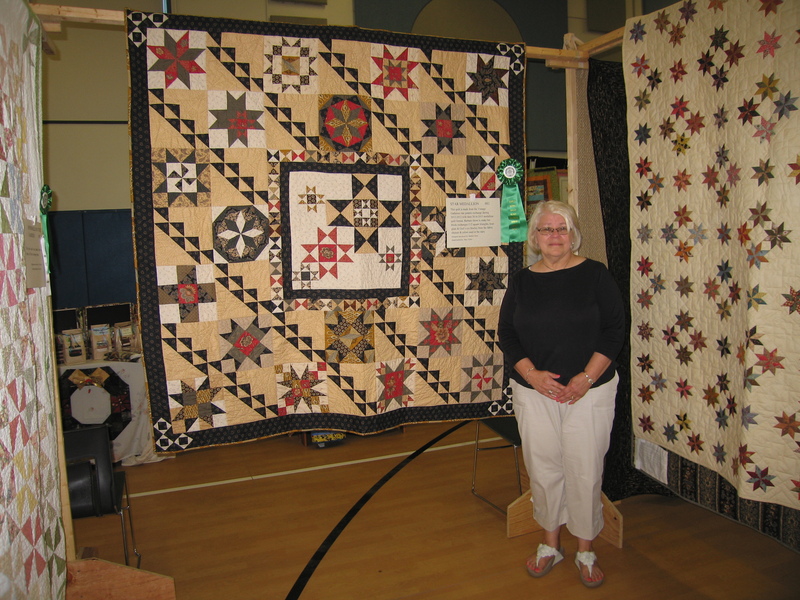 She was chairman for this show and starting with this, her love of judging and teaching quilt workshops began. At that time, Road to California Quilter’s Conference and Showcase was being developed. Swanson was hired to assist in coordinating that large international quilt show that has grown to be the premiere conference west of the Rocky Mountains. In 2006 Sandra and her husband moved to Pennsylvania. The $35 workshop fee includes lunch and a copy of Reynolds’ Stack-N-Whack book. Call 570-546-5917 or download 2016_MuncyQuilt_Workshop to register for the workshop. Admission to the Quilt Show is $8 per day, or $12 for a multi-day pass. More information is available by calling the Muncy Historical Society at 546-5917. On the Internet at www.MuncyHistoricalSociety.org or http://www.MuncyQuilts.com. This entry was posted on April 19, 2016 by Robin Van Auken in Quilt Shows.